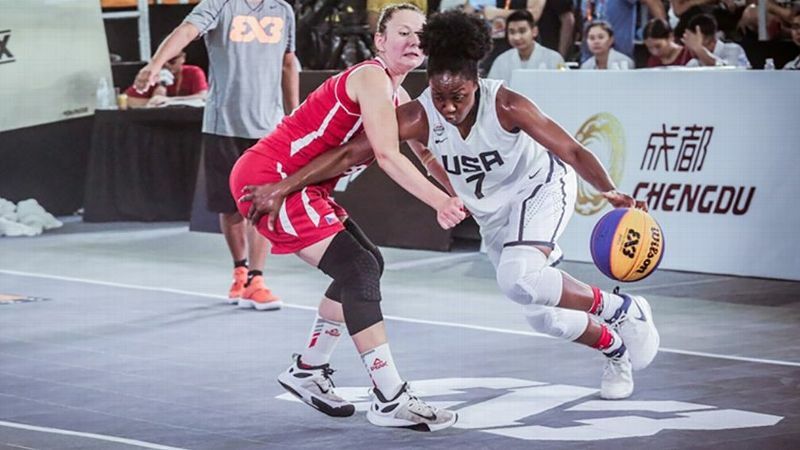 Diamond Miller helped lift the United States to a gold medal at the FIBA Americas U16 championships last month. Diamond Miller pounds the ball and zooms up the hardwood. She takes three dribbles before busting a crossover, a behind-the-back or a between-the-legs move and exploding away as if she were shaking free from a defender. Technically, there is a defender, if you count a mega-sized, rubber resistance band, about four inches thick, attached to her waist, controlled most days by her father, Lance Miller, or her trainer, Kerry Foderingham, who pull in the opposite direction to prevent Miller from accelerating forward. But no band -- or opponent -- has been able to hold back the 6-foot-1, 140-pound combo-guard out of Somerset, New Jersey. 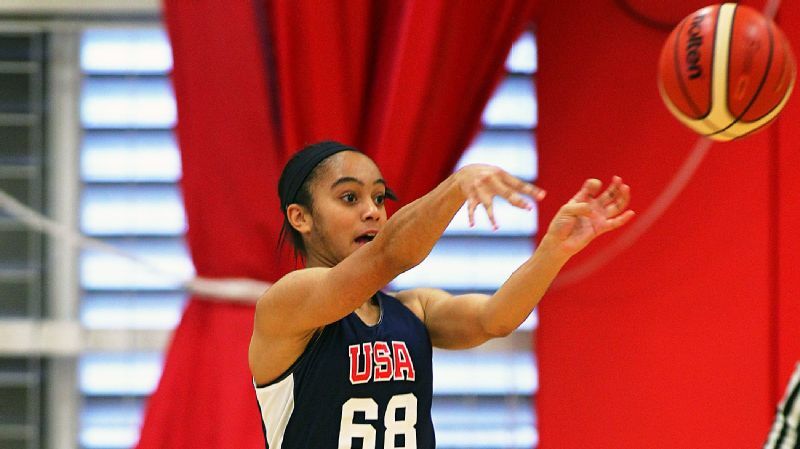 She helped USA Basketball win a gold medal at the 2017 FIBA Americas U16 championships in Buenos Aires, Argentina, in June, and is one of the most versatile prospects in the class of 2019. "The band makes you want to quit," Miller said, "but you have to keep going because you know in the long run those workouts are crucial for the end of the game. You might be tired, but you just have to push through." Coach Audrey Taylor blinked, and Miller was already at the other end of the floor. Miller, then a seventh-grader, grabbed the rebound out of the air and dribbled the full length of the court and stopped and popped for a jumper, eating up the full length of the court in about five seconds. "Wow," Taylor, now Miller's coach at Franklin High School, whispered to herself. "She's going to be a point guard?" Miller brings the unexpected: length and speed, ball handling and shot blocking. She's agile but forceful, elegant but raw. One play she'll scrap down low for boards, the next step out and knock down a 3. Her hybrid frame allows her to take advantage of smaller guards, using her quickness from years of playing soccer to race to the basket. Even if you feed the ball to her in the post, which isn't exactly in her comfort zone, she'll stretch from one block to another in a single pivot to put in the easy bucket. I think even refs have a hard time. They call travels more than they should because she's so long and can have such long steps. "I think even refs have a hard time," Taylor said. "They call travels more than they should because she's so long and can have such long steps." But Miller, who averaged 18.1 points, 6.6 rebounds, 3.0 assists, 2.5 steals and 3.8 blocks per game to help Franklin to a 25-7 record and the 2017 Tournament of Champions title, and who once swatted eight shots in a single game, offers far more than physical gifts. "Not many athletes at the high school level have an understanding of the game the way she does," Taylor said. "She sees things others don't see." Lance, who played for Villanova from 1989-93, taught his daughter to be versatile. His short jumper with 1.3 seconds left in the first round of the 1991 NCAA tournament propelled Villanova to a 50-48 victory over Princeton. "My kids, they weren't just told to be post players," said Lance, who coaches Diamond on his AAU team, TeamMiller Lightning. 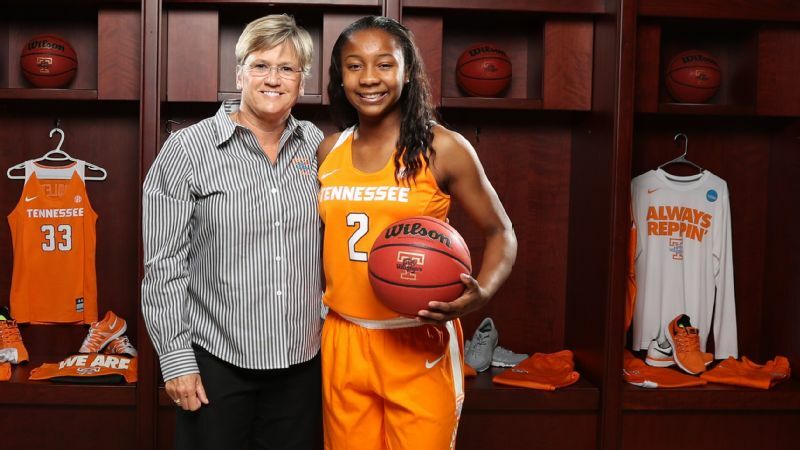 He also coached Miller's two older sisters, Adreana Miller, who plays at LaSalle University, and Laniya Miller, a high school senior who aspires to play Division I. "We told them they had to have skills," Lance said. "We basically take the mentality that 'If you're not working out, somebody else is.'" Diamond and Lance don't play one-on-one. "She can't stop me," Lance said, laughing. "Maybe in another 10 years." But Miller said her father taught her everything she knows. So did Candace Parker. At least, video clips of the Los Angeles Sparks veteran forward, did. When Miller isn't on the court or in class or devouring her favorite candies -- Mike and Ike, Skittles, Starburst, Kit Kat, Milky Way, Butterfinger (anything sweet that doesn't have peanuts; Miller's allergic) -- she's dissecting Parker's moves. Miller loves the way Parker battles inside and handles the ball outside, the way she calls for the ball on the block and on the fast break, and the fact that she doesn't fit into one box when it comes to positions. She also admires two-time gold medalist Parker's resilience to win the 2016 WNBA championship despite being left off the final roster for the 2016 Olympics in Rio de Janeiro. "She doesn't let none of that bring her down," Miller said. "That's why I love her so much." Miller can relate. 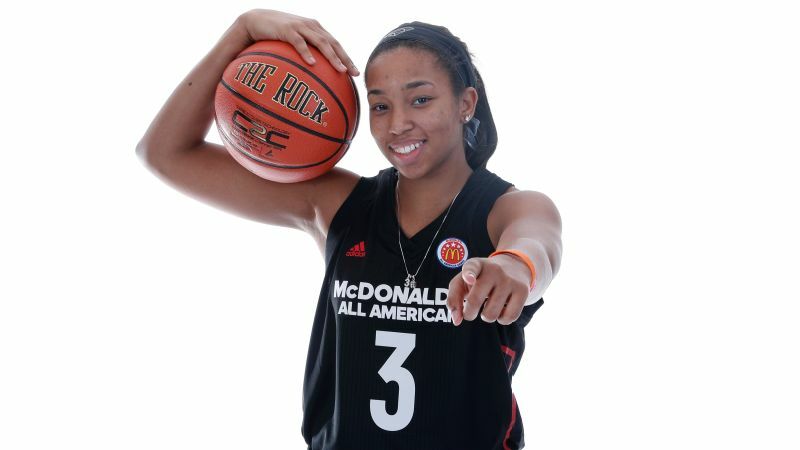 She wasn't always a ranked prospect, although she's now at No. 20 in the 2019 class. Her father told her to not focus on rankings; they're just noise, a distraction from the real task at hand. "Rankings and all that stuff doesn't really matter when you're in between the lines," Miller said. "Someone could be ranked higher than you, somebody could have a bigger fan base, have more height than you, but that doesn't mean they're necessarily better." 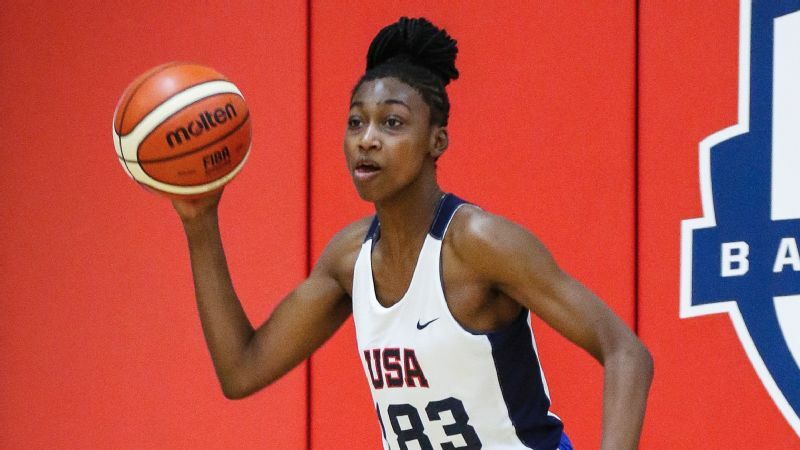 After not getting one of the 35 invitations to try out for the USA Basketball team, Miller still made the 12-player roster that started with 133 candidates. During the championship game against Canada, Miller caught the ball a few inches behind the 3-point line. Three seconds remained in a back-and-forth first quarter. Her defender's hands covered her eyes and she could barely see. But Miller didn't hesitate. She bent her knees, squared her feet to the basket and launched the deep 3, holding her follow through as the ball reached the bottom of the net to beat the buzzer. Miller contributed 10 points on 4-for-6 shooting plus four rebounds (three of which were offensive) to go along with two steals to help the U.S. eventually rout Canada, 91-46. "A lot of players don't have the competitive spirit that she has. She just has the will to win and she understands that it takes both scoring and defending to do that," Taylor said. "She's relentless."